Regular exercise may be able to offset disease-causing cellular damage and slow the aging process. 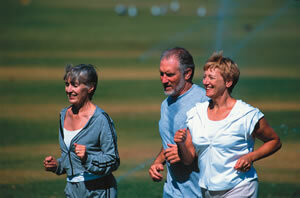 You can slow down the aging process with as little as 15 minutes a day of moderate activity. Exercise is good for you. These words have been a medical mantra for the last 40 years, but the adage is still as fresh as ever. As life expectancy climbs, many people survive into their 80s, 90s, and beyond. Better medicines and safer procedures can largely be thanked for the added years. But exercise maybe the key to why some people not only survive but also thrive in later life. "We're doing all these great things to keep people living longer, but when people hit their 70s and 80s, they're more likely to have many chronic diseases, not just heart disease," says Dr. Daniel Forman, who just moved from Harvard-affiliated Brigham and Women's Hospital to head the Section on Geriatric Cardiology at the University of Pittsburgh Medical Center. Aging takes place on the cellular level as a result of inflammation and oxidative stress. As cell damage accumulates, your metabolism changes, you gain fat, and you lose muscle mass, all of which make you more vulnerable to disease. "Being sedentary essentially ratchets up the process," says Dr. Forman. "People often fixate on their cholesterol, blood sugar, and blood pressure numbers. But exercise is the dimension that moderates other risks," says Dr. Forman. "If your cholesterol is a little high but you are fit, it's quite different than if your cholesterol is a little high and you're sitting on your couch all day." But doctors have not had a simple tool to quantify the benefit of fitness to use alongside hard metrics such as cholesterol, blood sugar, and blood pressure. In an effort to pin down the life-lengthening value of physical activity, researchers evaluated 30 years' worth of cardiovascular health data collected from over 16,000 people ages 20 and older as part of the Cooper Center Longitudinal Study. In addition to traditional markers such as body mass index (BMI), cholesterol, blood pressure, and blood sugar levels, they added into the equation a measured fitness score based on treadmill test results. What they discovered was that while the rate of cardiovascular-related deaths rose in a familiar pattern against the traditional risk factors, the individuals with the best treadmill test scores were 18% less likely to die within the following 30 years than people at the lower end of the fitness spectrum. In a nutshell, the more exercise you get, the better off you will be, as long as you don't hurt yourself. That said, any physical activity is better than being sedentary. Exercise has a cumulative benefit. Over 30 years, people who exercise regularly have very different outcomes than people who give it upafter 10 years, Dr. Forman emphasizes. Mountains of research attest to the fact that as little as 30 or even 15 minutes of moderate-intensity activity most days of the week can help lower your cardiovascular risk. Moderate-intensity activity includes brisk walking, swimming, and mowing the lawn. If you have physical limitations such as arthritis, poor vision, or balance problems, the key is to find a pattern of exercise—swimming, dancing, or lifting jugs of milk—that is within your capacity and that you can stick with. "It changes the whole notion of exercise, from the idea of pushing yourself to your limits, to the concept of doing anything that moves your body. The endpoint is not to make your muscles bigger, but to really change the way your body functions," says Dr. Forman. While you can't completely stop aging, staying active can slow down the destructive processes that lead to disease and immobility, which diminish your quality of life. "Most of my patients are very concerned about frailty," says Dr. Forman. "But in many ways, frailty is an iteration of aging gone bad—blurring into disease patterns. Your commitment to walking regularly makes a big difference to your overall health as well as your prognosis. It affects other attributes, such as cognition and mood, which combine to make a huge difference in how well you live, not just how long you live." You can estimate your 30-year cardiovascular risk using the online Lifetime Risk calculator tool (www.lifetimerisk.org). To perform the calculation, you will need basic information on your medical history and cardiac risk factors. You will also be asked for your metabolic equivalent (MET) score on a treadmill exercise test or other measured fitness assessment.